U Bein bridge locates in Myanmar, it is the world's longest wooden bridge, this bridge is one of the most ideal places to watch the sunset. UBein Bridge is 1.2 kilometers in length, connects two banks of the river Taungthamna. The bridge has become a familiar place of locals and Buddhist devotees to glimpse the sun set since last October. U Bein bridge is one of the popular destination when you dicide traveling to Myanmar, the bridge is located in the outskirts of Mandalay of Myanmar. This can be considered the oldest and the world's longest wooden bridge, it also be one of the many places that is visited and photographed the most by the tourists in this country. Located across the Lake Tayngthaman, U Bein bridge has a length of up to 1.2 kilometers, the bridge was constructed in 1800 by Mayor U Bein, material was taken from an ancient Palace. The Palace was abandoned when King Mindon decided to move the reign to the capital of Mandalay and the major pillars of the Palace became a part of U Bein bridge. Now if you notice the bridge, there are more than 1,000 large columns and thousands of wooden slab. Originally the bridge was built entirely of wood. From time to time, under the impact of nature, a number of wooden pillar has been replaced by the concrete piles to increase the stability for the bridge. Over years, U Bein bridge always attract people and also be an important part of the lives of local people. This bridge was also gradually became a destination with interesting visitors to Myanmar tour, many visitors and the shifang Buddhist came here just to see the sun set. The ideal time to visit U Bein bridge is in the evenings, the impressive images of brilliant golden orange sun covered bridges, through the wooden piles perhaps will be the most beautiful landscapes of Myanmar. At this point in the day, the weather is cool, thus people will be more pleasant with the waft of fresh and cool atmosphere. The longest wooden bridge in Myanmar on each evenings will be a memorable experience when traveling to Myanmar. 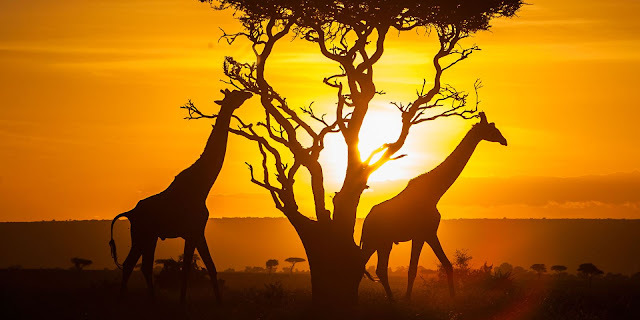 The second location is the Maasai Mara National National Reserve, located in the south west of Kenya, about 1500 square kilometer wide. This place in Kenya has attracted a lot of tourist. Sunset photos in African has created a radiant red, charming and captivating scenery. The best time to watch the sunset is from July to October, when the animals have migrated to other places. Masai Mara conservation area is home to many peoples from different tribes: Turkala, El Molo, Kikuyu and Maasai. All of these tribes are living together with nature, with many strange customs and colourful costumes. They created an interesting attraction for Kenya. The Maasai people is nomadic so they have very high independence, until now they still can maintain cultural values as well as the traditional rituals in daily life. Living on the steppe region of this vast, Mara Maasai people consider themselves as an inseparable part of this land. Traditionally, the Maasai people do not hunt animals that live in harmony with nature. Lions, goats are 2 animals that played an important role in the religious life of the Maasai aborigines. The unique point in the cultural of Maasai aboriginal is the crazy dance of the Maasai warriors around the camp fire and in the wild Bongo drums, this dance according to the patriarch is to ward off beast and prevent them from destroying the village as well as eating people's livestock. There is only the co-existence between people and wild animals without any special protection. 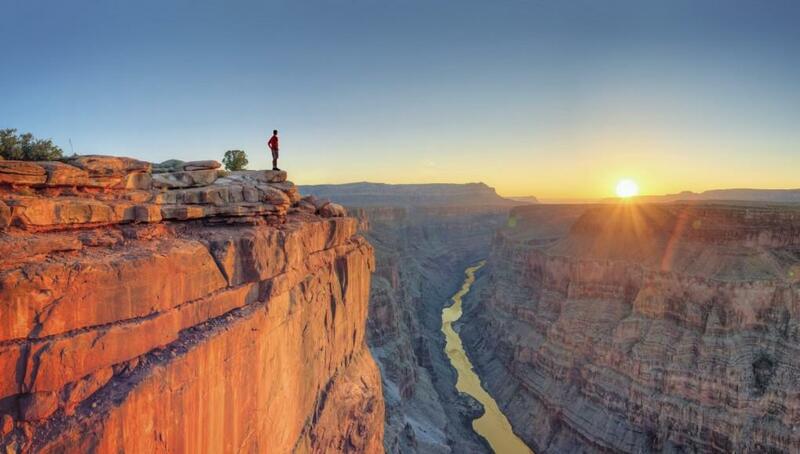 Each year, millions of tourists visited the Grand Canyon, the canyon was created by giant sloping banks of the Colorado River in the US state of Arizona. With a length of 445 kilometers, this canyon has also become an ideal place to watch the sunset with a special kind of mountain shapes. Visitors can reach the Grand Canyon from four different directions, but the most convenient is from the south because there is a forest, streams, charming scenery and convenient transportation. From the north and east, the road through the rugged mountains and some highways were closed due to snow in the winter. Southern arc (South Rim) of the Grand Canyon is located at an altitude of 2,100 meters is a national nature reserve by the 26th president of the United States - Theodore Roosevelt, signed a decree established in 1908. This is the traditional place to travel for American with long stone path along the edge of the ecological hotels, restaurants, campsites, airports and free bus service system. Northern arc (North Rim) of the Grand Canyon due to higher situated than the southern (approximately 300 meters) số thẻ atmosphere here is colder. Although it just 16 kilometers far from the southern if we travel by plane, the real distance is 344 kilometers as we must go way around the canyon. At the South Rim of the Grand Canyon, visitors can buy tickets to tour the Grand Canyon train Train ancient plays since the early 20th century, the medium-sized breakfast great scenic areas in the chilly atmosphere at early morning. If preferred a little bit about adventure and want to be close to nature, you can explore the Grand Canyon via hiking, long or short trip depending on the your health, you should follow the trails along South Kaibab Trail or Bright Angel Trail. If long-period booking has been done, visitors can experience the feeling of riding mules along the trails, just like old-style far western American cowboys. And finally, it's hard to describe the feeling, when visitors reach the destination, to the bottom of the abyss to dip their heels into the fresh, cool water of Colorado river. You will not know if you have set your foot to the heaven or just still in the middle of the road and go deeper into the earth. However, for many visitors, perhaps visiting West Rim is a more appropriate plan because from this arc to Las Vegas is only 3 hours away. In 2007, a Chinese-American investor, with the permission of the Indian tribes Huapalai, actual owners of the western Grand Canyon, has built a unique glass - steel structure, horseshoe shape in the world, reaching more than 20 meters away from the cliff, and 1,600 meters above the Colorado River. This work was named the Skywalk because tourists walking on the glass bottomed bridge can enjoy a panoramic view of the Colorado River as well as the flying bird right below their feet. The fees to Skywalk is as the estimation of 32 dollars and cost another 18 dollars more if you want to take a tour to the entire Huapalai aboriginal cultural conservation. However, in order to please the tourists who just want to taste the sensation of floating on Colorado river but do not want their to be "entangled", there are tours to explore Grand Canyon by helicopter and and small plane. With only about $ 200 a person, lovely helicopters of Pappillon Helicopter will take the tourists from airport, through the steep shores, and gently land at the small landing site at the bottom of the abyss, right next to the river bank. This is a rare chance for visitors to experience the breathless moment when they sit on the helicopters watching the brink pass through their glance. The genial American pilots, ready to perform the swing technique (tilt suddenly) or downgrade of sovereign default with the breakneck speed, to "buy in" garlands of excited cheers from the visitors. If you have one chance to come to Las Vegas, you should not ignore this importance of this unique place.